Google’s new Chromecast device is a simple thumb drive-sized dongle that fits into an HDMI connector on any modern TV, allowing you to stream video content and music using your home’s WiFi connection. In fact, this $35 device makes it so easy to stream content, you need to watch your bandwidth allowance if you aren’t on an unlimited plan. Your monthly Internet bill will thank you! A Closer Look at Chromecast: How Does it Work? 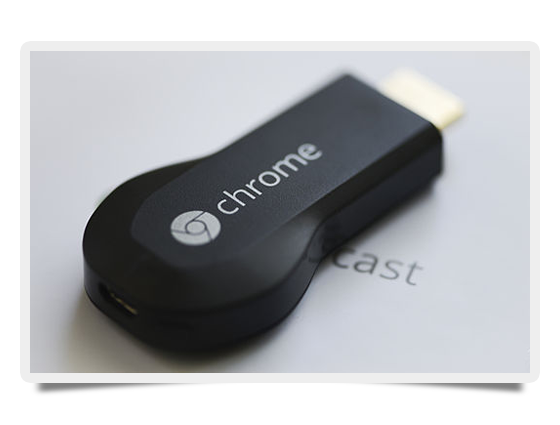 Chromecast runs on a simplified version of the Chrome operating system. You control the device using the Chrome web browser on your desktop or laptop computer. Additionally, a variety of mobile apps for the Android and iOS platforms support Chromecast. YouTube, Netflix, and the Google Play apps currently allow you to stream music and video to your TV or HDMI-equipped AV receiver. Many other mobile apps are in the process of adding support for Chromecast. These include HBO GO, Hulu Plus, Pandora, Redbox Instant, and Vimeo. If the device takes off in popularity, it is reasonable to assume many other content providers will be joining the Chromecast party. Android fans will be pleased to know Chromecast also provides access to the Google Play store in addition to previously purchased media content. Despite the similarities, Chromecast doesn’t provide all the functionality of Apple TV, most notably the ability to stream locally stored pictures and videos to your TV. But considering its much lower price, many users won’t miss those features. A new update to the Apple TV software will allow that software to stream media from the Cloud in the same manner as Chromecast, so it is obvious the Apple folks in Cupertino, CA, see the device as a competitor. Remember, though, if you don’t have an unlimited data allowance with your Internet service provider, make sure to keep an eye on your monthly usage, as the Chromecast makes it easy to use up your bandwidth, leading to a very big Internet bill. Plus, do you even know what kind of bandwidth speeds you have at home? Take a speed test from BandwidthPlace.com to find out!